A child’s playhouse. A bird nest. A mythical woodland. 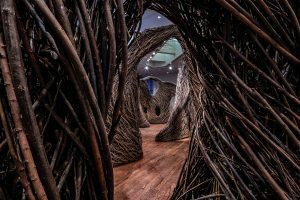 All describe Windswept, the new BYU Museum of Art installation that weaves 30,000 pounds of willow saplings into sweeping archways and hollows. Some 100 BYU students and community volunteers assisted in constructing the exhibition over three weeks. The artist, Patrick Dougherty, has built more than 300 such works around the world, from the Smithsonian to Serbia. “If you take these sticks out of the woods, they become lines with which to draw,” he explains. Like most of his works, Dougherty designed Windswept impromptu, drawing inspiration and help from his locale. His muse: the Wasatch ridgeline. Windswept is on display at the MOA through October 2019. After Ryan Moffett was diagnosed with multiple sclerosis, he turned to his art as a way to find peace. Paul R. Stavast, director of the Museum of Peoples and Cultures, shares a few favorites. Lance and Jacqui Larsen, known by locals as “the art couple,” have paired his words and her images for 30+ years.